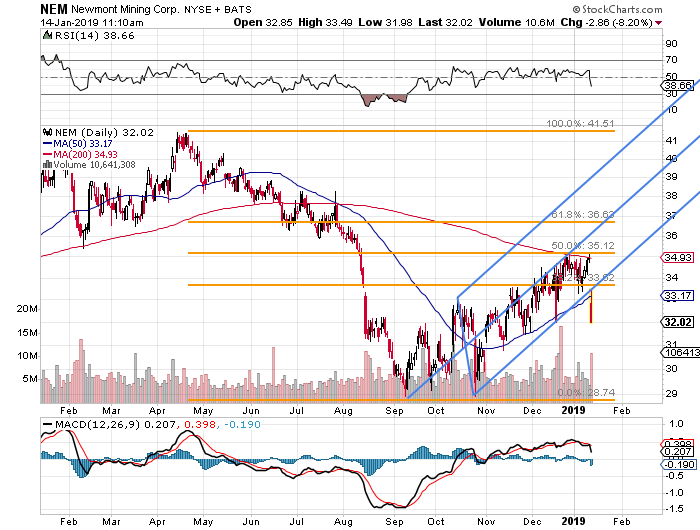 Newmont Mining will acquire Goldcorp in a $10 billion deal, and here's how I'd trade Newmont. The urge to merge is spreading. Two weeks ago, news broke that Bristol-Myers Squibb (BMY - Get Report) would spend $74 billion for Celgene (CELG - Get Report) . Then we heard that Eli Lilly (LLY - Get Report) would acquire Loxo Oncology (LOXO for cash. Almost immediately, the talk swirled around BMY as a potential takeover target itself. It's not just the pharmaceutical space, friends. The break of dawn brought to our midst another "Merger Monday." First, I saw that First Digital Media would push Gannet (GCI - Get Report) to consider possibly making a sale at or close to the $12 level. Then, I saw hard news. More consolidation among the gold miners. Three months back, Barrick Gold agreed to buy Randgold Resources for $5.4 billion. That deal was not finally approved until mid-December under the Barrick name, using the Randgold symbol (GOLD - Get Report) . That put pressure on the industry. You see what is happening across these industries. Either firms are feeling compelled to buy growth when organic growth becomes difficult, or when that growth just becomes far cheaper to attain in this way. Newmont Mining (NEM - Get Report) will acquire Goldcorp (GG - Get Report) in a $10 billion deal. This deal, which is a little wonky, creates the world's largest gold miner. What do I mean by wonky? Well, if you happen to already be in either of these names, NEM will pay 0.328 of it's own shares for each GG share, plus two cents. The thought behind putting thee two industry leaders together is size and scale. The combined firm should produce roughly 7.9 million ounces of gold per year. The plan also calls for the combined firm to sell assets worth up to $1.5 billion over the next two years, focusing only on more productive mines. Apparent synergies should deliver up front savings of up to $100 million. I like gold, physical gold. I believe in the yellow metal as a vehicle for delivering a well-rounded, diversified portfolio, not to mention as a safe haven on that day that we hope never comes. I like the SPDR Gold Shares ETF (GLD - Get Report) as a way to trade gold, or round out portfolio exposure. I don't generally like the miners, and have never made a habit in investing in this space. Gold has had a nice run as equity markets reacted to the various issues around global growth, international trade, and policy error. Yes, there still is safe haven value there. Perhaps that is one reason why there is now a rush to consolidate, ahead of any potential run. Don't forget clean water and canned food. You'll need those also. The industry has a history of under-performance even at times where the precious metal has done well versus the U.S. dollar. Should you feel compelled to invest here, these are quality names, and the intention of this combined entity is to pay out "the highest annual dividend among senior gold producers." Just beware. The future of the space likely involves more consolidation, as well as less quality at the low end in the way of spin-offs of lesser mines. Buy the business of gold? Or maybe just buy some gold. My opinion is to go for the metal. However, for those less enamored, there are ways to trade this news. Should One Feel Compelled to Go There? Try this risk reducing way to get involved. One quickly sees that the uptrend that starts with the September lows, came to a screeching halt at a 50% retracement of the move lower from the April highs. Not only that, but that this level had been tested from below multiple times over a couple of weeks. This morning's merger inspired selloff has found support at the $32 level, which worked for traders in December as well. Here is one way to go about this. The firm will report late next week. In order to capture some premium, we'll have to push options portions of this trade out a couple of months. -Purchase 100 shares of NEM at or close to the last sale of $32.02. Note: The aggregate credit from the options sales will reduce net basis to 30.08. Max profit on the initial position is limit to being called away at $35 by the Ides of March. That's a profit of 16.4%. Worst case here is being forced to eat a second lot of 100 shares at $29 at that time. Should this occur, the investor would end up long 200 shares at a net basis of $29.90. A cautious investor might not sell the put option as that does add risk to the scenario. At the time of publication, Stephen Guilfoyle was Long GLD.